Join the discussion on our forums! Come discuss Heavy Metal! over in our dedicated Heavy Metal! discussion topic. I can see this card's potential , can get you some good / bad minion , based on armor. you can run this with Deadman's Hand and Bring It On! and if fatigue/Infinite Warrior works, you could technically create an infinite loop that allows you to summon a 10-drop every 3 turns without dying to fatigue. Granted there's the question whether that is even worth it, considering killing them with fatigue should be enough most of the time, but who knows what lategame strategies there are going to be. Just the combo potential due to lower mana cost has some interesting implications for the future, that Yip just didn't have. Bad but apart from that - WE NEED NEW ETC LEGENDARY NOW! They just peeled off a 4/8 body and the two mana stuck to it and this card remained. You missed the fact this spell works only once. Blizzard always make this kind of cards, were is the same mechanic of other card. I don't care if it is good or bad i want original ideas. I think itll work in an armor gain type warrior. If it was 5 or even 7 mana it may be played more since it could fit into odd warrior. 6 mana is prob the worst spot for it. 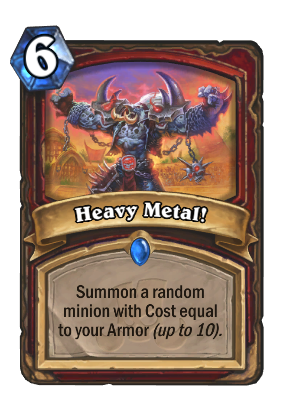 We may even see a low warrior card that reads something like "at the end of your turn, gain 2 armor" or something to make this more viable. That's right , would be insane if it was. Way worse than Lollosculptor Zomg.